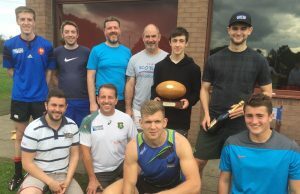 The Club was buzzing at the weekend, as various activities were taking place against the backdrop of player registration and membership renewal. The weekend kicked off with 5 school fixtures against Hutchesons GS – three at home and two in Glasgow. All teams acquitted themselves well against very strong opposition, with the S2s coming away with a fine 6 try win. The afternoon saw over 40 players – a mix of u18s, senior players and coaches – participate in the Bennie Ba’, with the players split into 4 squads for a Tag Rugby tournament. Team 4, pictured below, won all their matches and claimed the Bennie Ba’ trophy. Craig and Anne Young had fired up the BBQ to feed the players and Club Volunteers who had come along to watch. As the afternoon drew to a close, there was the unusual sight of tents being pitched around Mains Park, as the Wee Reds Micros “Dads and Lads” overnight camp took shape. As night morphed into day, a number of sleepy faces emerged for breakfast, followed by a training session, as the Micros were joined by their older Mini colleagues. 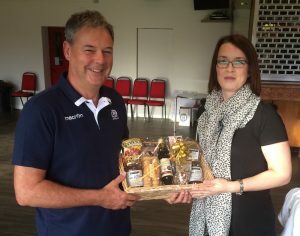 Congratulations to Susan Lynagh who was the winner of the Registration Weekend Hamper donated by Craigie’s Farm Deli and Cafe, one of our Club sponsors.